MELVILLE, N.Y., February 20, 2018 (Newswire.com) – RingLead, a leading data management provider protecting over 300 million customer records from some of the leading technology, financial and healthcare businesses across the globe, today announced four new major features to deduplicate and standardize data. RingLead introduced support for custom object deduplication, mass delete, mass update, and Salesforce connection refresh to enable users to more effectively identify and merge duplicates using flexible matching criteria on any field or object. The addition of these features enables individuals to leverage user-defined rules and automation to reduce hours of manual labor and optimize their data cleansing process. Custom Object Dedupe – Designed to enable users to identify and merge custom objects, this feature enables users to merge custom objects, including cases and opportunities, while preserving all Activities and Related records. Mass Update – Designed to enable users to change thousands of Salesforce fields instantly, Mass Update includes unique filters to identify the records you want to change field values of. Change multiple fields at once, configure the field value to a specific value you enter, or set the field value to the value of another field. Mass Delete – Designed to simplify how users mass delete erroneous data, Mass Delete features filters to help users identify subsets of data intended for deletion. Salesforce Connection Refresh – Fueled by customer request, Salesforce Connection Refresh ensures RingLead DMS is always running on your most up-to-date configuration of Salesforce. 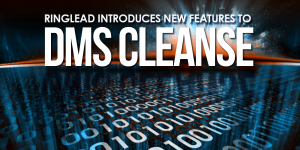 Custom object dedupe, mass update, mass delete, and Salesforce Connection Refresh are now available in DMS Cleanse, as well as RingLead’s end-to-end data management solution, DMS.